It was deja vu for Cumbernauld Colts as they went down to Spartans on Saturday for the second week running and the third time this season. In contrast with the previous two league matches Colts got to the end of regulation time on level terms in this South of Scotland Cup third round tie. But it was the same old story in extra-time as Spartans punished Colts’ failure to take their chances. Early on Colts ’keeper Chris Fahey turned a George Hunter effort from eight yards round the post, but after that the visitors had the best of the first-half chances. Crosses by Robbie Duncan and Andy Hunter just eluded the Colts attackers and Stephen O’Neill and Jordan Pirrie had efforts from distance. Scott Davidson headed a Blair Munn corner wide from eight yards and Jeff Fergus, on the stretch, could only find ‘keeper Blair Carswell’s gloves from a wonderful Duncan delivery. The best chance of the half fell to Hunter who was through on the ’keeper but rather than square for the supporting O’Neill to tap in he was caught in two minds and his touch to round the ’keeper was too heavy, leaving a finish impossible. After the break neither ’keeper was unduly troubled until a moment of brilliance from O’Neill nearly caught out Carswell who just managed to tip over his chipped effort from 35 yards. Davidson headed wide from the resulting Munn corner. However Colts took the lead in spectacular style when Munn stepped inside a challenge and, from 25 yards, fired a curling effort with the outside of his right foot in off the underside of the bar. But as the game moved into stoppage time a moment of inexperience from Colts allowed their hosts a late lifeline. O’Neill robbed a defender and made towards the home goal before firing in a shot which Carswell saved - but with men up in support unnecessarily Colts were caught on the break. Michael Oliver was forced into a challenge which clipped Alan Brown and Keith Murray stepped up to level from the penalty spot and take the tie into extra-time. The first additional period produced little of note, other than a challenge on ’keeper Fahey which the visitors were unhappy to see go unpunished. Into the second half and Colts had a decent chance to take the lead as Jonathan Black skipped past two challenges and looked to square to Hunter who was free in the middle, but experienced former Clyde defender Eddie Malone did brilliantly to cut out the ball when he found himself in a two against one situation. And the missed chances throughout the game would come back to haunt the Colts as they again contributed to their own downfall, defending poorly against a short home corner. No second man went out to close down the most dangerous player on the park, David Greenhill, who delivered a wonderful whipped cross from the left with his right foot and Ewan Saunderson got his toe on the ball in front of Fahey to poke into goal from six yards. It was another poor goal for Colts to lose and absolutely preventable, but credit to the home side for exploiting the weakness. And in Greenhill, Spartans surely have one of if not the most impressive central midfielder in the Lowland League - in three games with Colts he has certainly been involved in everything good that Spartans have done. David Brown made his return from injury with five minutes remaining, coming on for Hunter who had picked up a dead leg and was struggling to move. And his instincts nearly brought him a late chance as he drifted into space in the area, the ball arriving into his path but Malone made another excellent last ditch diving challenge to nip the ball off the striker’s toes. Over the two games Colts will be frustrated to have taken nothing given the chances created and missed but they will look to learn from the experience. 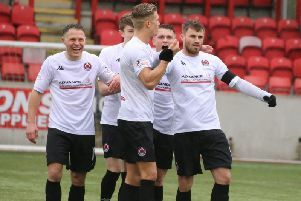 They remain fourth in the Lowland League table and return to league duty this Saturday when they are on their travels again with an away match at bottom-of-the-table Threave Rovers.